LEXIE CANNES STATE OF TRANS — The North Carolina anti-transgender ‘Bathroom Bill’ saga has suddenly turned into a television legal drama miniseries. The actual drama unfolding in NC however, requires a suspension of disbelief previously unseen in a TV script. “This is not the first time that we have seen discriminatory responses to historic moments of progress for our nation. We saw it in the Jim Crow laws that followed the Emancipation Proclamation. We saw it in the fears and widespread resistance to Brown v. Board of Education. Sources: News & Observer, New York Times and Politico. Together, this world becomes a more just, and safe place for all of us sexual minorities. Found posted on Facebook: Such a powerful, powerful statement [We see you . . .] As I was watching this, I could only imagine the effect it would have on some young trans kid who’s being bullied at school and thinks they’re all alone. With this statement, lunch, and the Obama Administration, literally saved lives today. 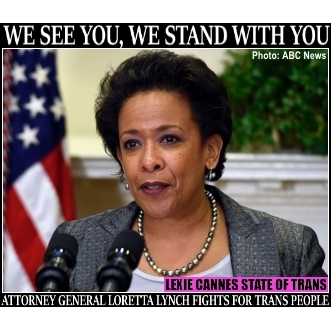 MS Lynch should run for president next term . So glad peace is coming to the trans community in NC.But it still won’t stop the hate down there.